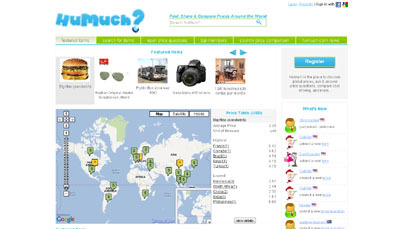 HuMuch.com is a global price comparison website. It is the place to discover global prices, ask and answer price questions, and compare cost of living across different countries. The innovation is the use of crowdsourcing. On our site, consumers around the world can share their favorite items and prices from around the world. We then aggregate, normalize, and present for easy comparison. HuMuch’s mission is to improve price transparency around the world. There are 2 major types of competitors: (i) Current price comparison websites. They do not, however, offer international price comparison. They are limited to their home country, or region. They are also limited to items sold on the web. (ii) Current cost of living websites. They do not offer, however, transparent comparisons. They often only provide an index and % over or under.